Setting the industry standard, HUB freestanding crucible furnaces combine superior efficiency with easy maintenance and crucible change. Customers claim 30-40% and more increased efficiency after changing to MU furnaces from day tanks. Our furnaces are designed to open from the front which makes crucible changes easier and allows access to the interior for maintenance. We have been building these furnaces for more than 20 years. All of them are still in operation. With proper care, these furnaces should last a lifetime. 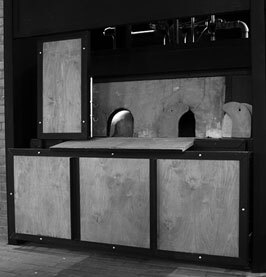 Each furnace is shipped with a mold for casting a new gathering port block and a spare door. The gathering port block is typically replaced at every 3rd or 4th crucible change, depending on wear. A manual with step-by-step instructions and pictures detailing the process of changing the crucible and routine maintenance is included with each furnace. Crucible life is easily one year. We recommend a yearly shut down for crucible change and maintenance; however, many customers have claimed 20 months and more of continuous use. The interior of these furnaces is a cast high alumina lining. This is an incredibly rugged system that is backed up with a minimum of 10” of 12 lb. per cubic foot fiber insulation. The heavy insulation and thick refractory lining maintain even heating and allow quieter operation utilizing smaller burners. Furnaces are delivered on heavy duty bases, w/ heavy steel exteriors and include levelers. Wheels are also standard. 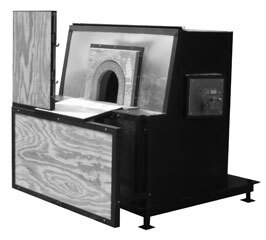 As with all of our equipment, these furnaces are designed to accommodate a wide variety of burners and control systems. 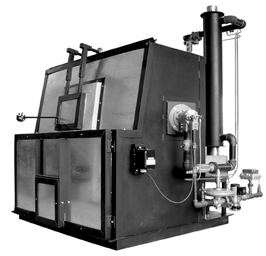 Combustion system prices vary depending on size, type of burner, flame safety requirements and the level of automation desired. For pricing please see Electric Furnace Heating Packages on the Combustion Control Systems page. HUB now offers two standard size Day Tanks (DT) designed for efficiency and durability. HUBs Day Tanks incorporate superior insulation. Although these furnaces are not as long lasting or quiet as our pot furnaces, they are more efficient and quieter than most day tanks. Like all HUB furnaces, HUBs tanks provide a shelf at the door. Our standard sizes are listed below. In addition, we also build custom tanks to suit individual production requirements. This 2 crucible furnace was designed under the guidance of Gianni Toso specifically for melting colored glasses. 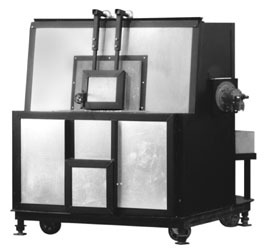 This 2 crucible top sliding furnace was designed so that the crucibles can be lifted out and poured. This is an excellent opportunity for those of you who want to build a great furnace, save money, and learn more about building equipment. The step by step instructions (with 62 photos) detail the process of building a furnace. These are the same steps that we use here at the HUB. The book contains complete drawings of the refractory and metal parts. There is a comprehensive list of refractory and materials needed as well as lists of tools, supplies, and vendors to help make procurement and preparation simple. Rentals include backup support—it couldn’t be easier. HUB sells high quality refractory and has stocking distributors nationwide. See Refractory & Crucibles.